The inspiring and determined fine flavour cacao champion sheds some light on the state of the world's cocoa farming. At The Chocolate Festival at the end of last year I was talking to Xoco founder Frank Homann, about the future of cacao and in particular fine flavour varieties. As always I found him passionate and eloquent about this little understood resource. 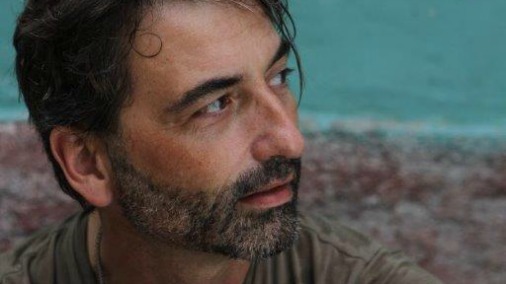 He has made it his life’s work to try and identify and nurture fine and heritage cacao varieties, and provide them direct to chocolate makers. The results of his labour is now to be found created into exceptional chocolates by some of the world’s finest chocolate makers and chocolatiers. Duffy Sheardown for one has been working with Xoco beans from the outset, and the delicious results only have to be tasted to be understood. Much of our conversation on that day centred around how to change public perception of chocolate, and how that was at the heart of the problems that are mounting for the future of the world’s fine cacao. As Frank put it, cacao and chocolate are thought of as commodities, not as a varied and delicate crop, full of potential, or the nuanced, highest quality product that can be made from it. Cacao has been thought of as a cheap bulk resource. Chocolate has been thought of as something to grab off the supermarket shelf. Variety? Well that would be dark, milk or white. The economics resulting from that perception are disastrous. Mayan Red pods on flowering trees. Tell me about your life before cacao. I started my career in the Danish Army, where I spent nine wonderful years as a commissioned infantry officer. I loved the camaraderie, the commitment of the people and the outdoors. Later, I made a bit of a shift when I took and MBA and joined McKinsey & Co., the management consultancy. After a few years as a consultant, I started a high tech company together with a couple of colleagues. We developed what is today the world standard for wireless narrow band communication between dumb nodes, that is for example connecting light switches, sensors, alarms and thermostats in a “smarthome” context. We later sold this company. When and why did you decide to start working with cacao? I had been living in Mexico for a while, with my kids. 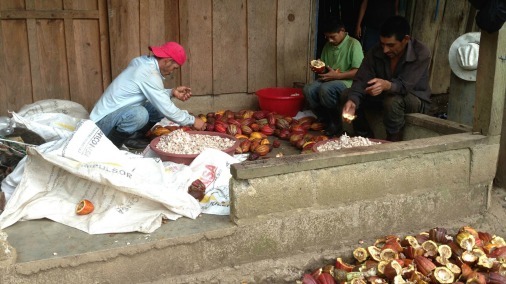 A former colleague from McKinsey was doing a NGO project in Honduras, and I joined in on a study of the future of cocoa as a means of combating poverty. The conclusion was clear: Bulk cocoa is not a business for small holder farmers in Latin America as the prices paid are below cost and very volatile. However, fine cocoa could be if sufficient price premiums could be achieved. But, as things go, they didn´t go anywhere in the context of an NGO. Many meetings, much goodwill, but very little action. So one day, i decided to start a fine cocoa company myself. 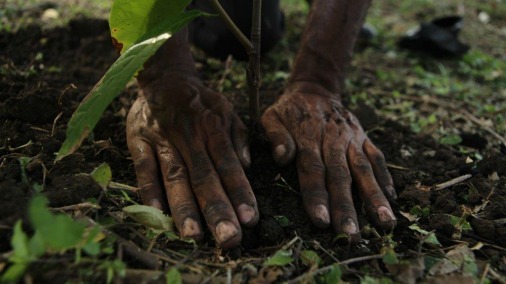 Planting young fine cocoa trees. 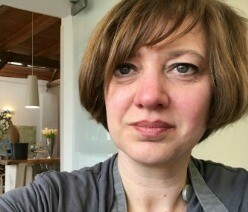 Tell me a bit about what Xoco does? From the start on, the focus is on getting to the best possible quality cocoa. From a cash flow standpoint a little irrational, as quality costs. Noone has really done this before on a large scale, so we had to pioneer a lot of stuff. Quality of course, starts with selecting the cocoa plants. There are tens of thousands of different cultivars, each with their own flavour characteristics. Problem is, they are all scattered over the tropical belt, in different countries, and on individual farms. 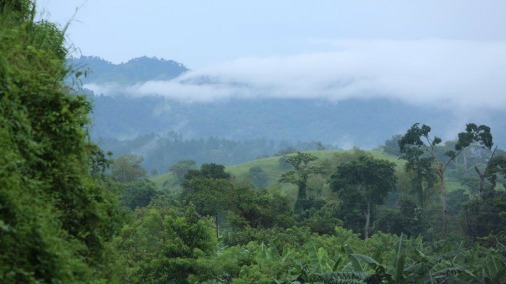 A fine cocoa farm in Venezuela, for example, of 2 hectares, can easily have 10 – 20 different cultivars on it. Chuao, the famous cocoa growing area in Venezuela, has 36 different cultivars. What we did, was to identify the best flavour cacao in Central America and reproduce these trees in volume in nurseries. 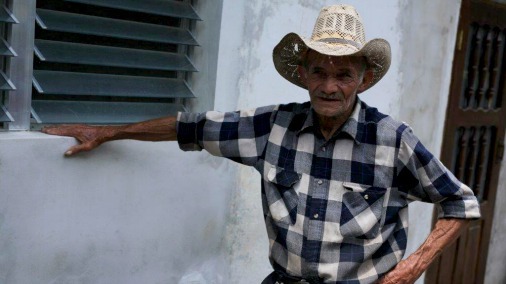 We persuaded small holder farmers to acquire the plants in an exclusive relationship with Xoco. 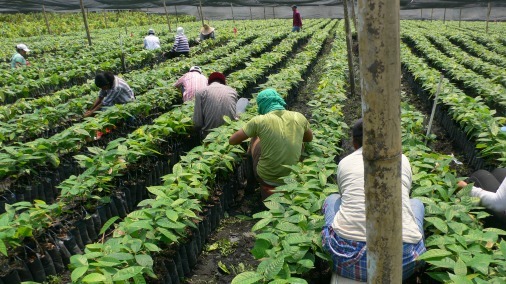 We provide technical assistance for the lifetime of the trees, and we collect the beans for processing and export. We pay the farmers a premium price that is two to three times higher than the normal price for cocoa. Much higher than so called “fair trade” cocoa. So today, we are starting to collect the harvests from the trees we have planted over the past eight years. It goes slow, but this year we hope for 30 to 40 tons total harvest. Branch with buds from selected fine cocoa tree. 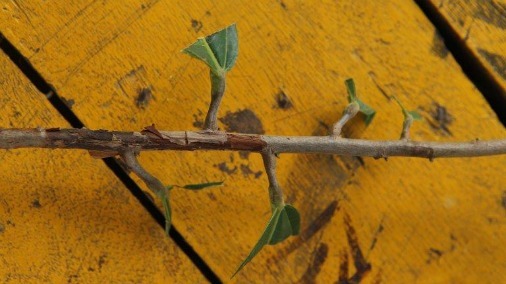 Buds are grafted onto root stock to create new young trees. 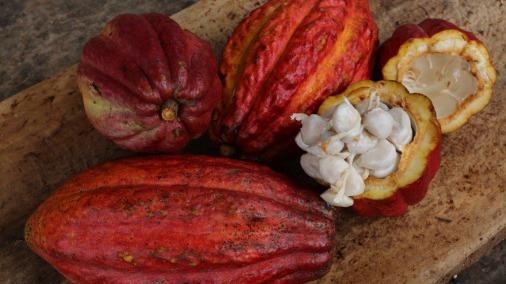 What are your hopes for Xoco, and the fine and heritage cacao varieties you have worked for? We truly believe that we are at the vanguard of a transformation of the industry. Chocolate makers, even the better ones, have not been able to source very many gourmet beans, and producers have not been incentivized to do so because the market for good beans is so very small. We hope that we can help the better chocolate makers get better beans and explain the very noticeable difference to the end consumers. I hope we, when we get success, will help set the way for other cocoa growers in the world, so they start to improve the quality and differentiate their products. Cocoa is for chocolate, an indulgence, luxury product. There is no reason it should be sold as a commodity product. It is just so wrong. It must have been a steep learning curve for you to pioneer in this area. What have been some of your greatest discoveries? There are quite a few. One of the most important has been to learn to manage large scale grafting of trees, getting them out there in the fields and take care of them. The first years were difficult. Costly. Another, is that the genetic categories of cocoa really say very little about flavour. You can have bad/neutral tasting Criollos and Trinitarios, as well as very interesting forasteros. Some are awful though. The grower industry is not very sophisticated at all and has been dominated by the agenda of high yields for decades now. There are many problems with this focus. 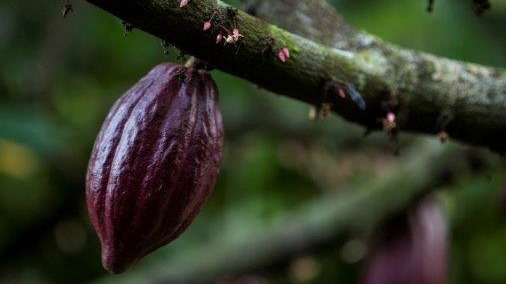 The worst is of course that high yielding trees tend not to have any good flavour, and so they add to the making cocoa a faceless commodity product. Also, higher yields eventually means higher supply and lower prices. So many industry people think growers should enter this death spiral, a race to the bottom, where they invest in higher productivity and then get lower prices, and eventually never make any money. Of course, growers are not dumb, so nothing happens. I haven´t seen any large scale hi yielding farms in my career. The untold story is also that for a tree to yield more than average, it needs lots of fertilizer. Almost all cocoa growers in the world are small holder farmers, who do not use fertilizers, so the high yield strategy needs a industry shift towards larger farms. When will that happen? Mayan Red pods one opened with pulp mass and beans visible. How have you seen consumer and food professional attitudes change towards fine cacao since you started? Not a lot, yet, unfortunately. On the positive side, there are many new small chocolate makers and a lot of interest from consumers. On the negative side, many so-called gourmet chocolate makers, make poor chocolate because they buy cheap beans. One French, a rather large one, apparently completely shifted from buying mainly fine cocoa ten years ago, to buying more than 90% of their cocoa today from the bulk market. They still seem to be doing great, even if the quality has gone down. Consumers didn´t notice, because there are so few available alternatives out there. So they got away with “milking the brand”. 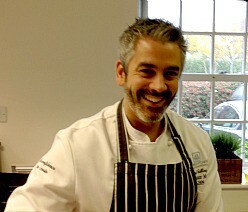 But, I see a new generation of chocolate makers coming out with aspirations that are much higher. In the end they will prevail, because their products simply are better, and consumers can notice the difference. In London you and I discussed the current crises facing cacao farmers, and what a gulf of understanding there is in consumers as to what chocolate actually costs.. Can you sum these up these issues from your point of view? It is the “Wal Mart effect” that is paralyzing the industry — consumer are perceived to want lower and lower prices. So the big candy makers entered the race for lower cost. With their mighty purchasing power, and growers being small, unorganized, and un-sophisticated, they ended up pressing prices for cocoa down below cost. That is, they pay marginal cost, but if you do a cash flow analysis for a African or Latin American farm, they are not in the money. That is why no-one is reinvesting in cocoa farms. Much less in fine cocoa, because it is so expensive to start in this field. In most cases, you have to start as we do with new young trees and wait five years before you have a commercial harvest, and another five before you are at peak production. Meanwhile, as big candy cannot pressure prices any lower before no cocoa will be delivered to them at all, they have now started to cut costs by making their chocolates smaller sizes. What is next? Sooner or later one of them has to be the first to go out there and say: We will now charge you, the consumer, more than $2.99 (the magic pricepoint). When they do that, they better have a good reason, like for example, a better product that consumers recognize as a better product. Xoco farmer in Honduras Copan Highlands. 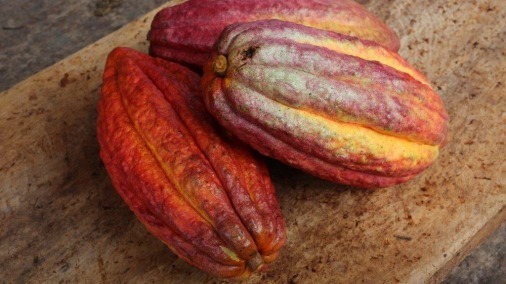 How do you think the cacao & chocolate markets are developing going forward? I think we are at an inflection point, coming very soon. Some first mover with market power has to start going down the road of better quality chocolate. When that happens, new competitive dynamics will emerge, that again will encourage better cocoa. Then the growers will start to get more sophisticated. In the end, consumers win because we will have more choices. Are there good things about these developments? Today, it seems pretty bleak, almost as if a stalemate. But I really think it is quiet before the storm. In addition to your work with Xoco, which has done a huge amount to preserve heritage cacao, do you have ideas as to how we can encourage the good, and potentially change the bad? Value is the key. If you have a better product, consumers (people) will want it. That is powerful. Preservation is not a goal in itself, cocoa is not like some rare animal in threat of extinction. Cocoa is a wonderful fruit, with lots of fantastic flavours and applications in food. It just happens that the cocoa we have is heritage cocoa, original to the countries they have grown up in, and related all the way down to the trees they Mayas had. 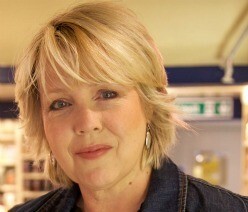 But it is only relevant because the flavour is good, and much better than the other stuff. 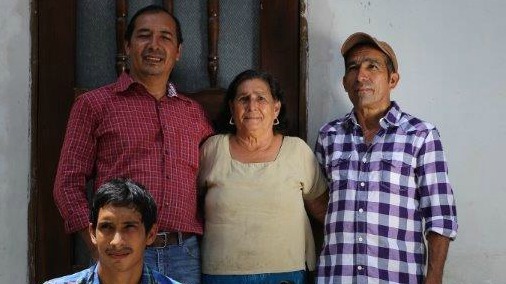 Farmer family in Copan Highlands Honduras. Has your palate and feelings about chocolate changed since you started? I can´t eat sugar candies any more. A little sugar is fine to highlight the flavours, but much too much so-called chocolate today is mere candy. I can also taste whether good beans have been used in chocolates and if there were any flaws in the processing, collection, fermentation and drying, of the cocoa. Opening pods at collection center at wooden house. Duffy’s Mayan Red of course. And there are a few others coming out this year with our beans. I really like Patrick Roger, of Paris, also. And Domori. And Åkesson, Marou, and a whole lot of others, many of the makers and growers are good friends too. Luckily, most of us are having a good time on our journey. After all, we are the good guys.